Doodle is a free online appointment scheduler that can be used to book meetings and other events with friends, colleagues and anyone else. Email threads trying to book a large number of appointments can quickly become confusing and trying to mark off available and booked time slots on a piece of paper is not conducive for amendments and changes of plans. No more emailing back and forth endlessly. Finally, there’s a better way. Get started with Doodle today. Doodle is great because there is no hassle involved, it is incredibly quick, and anyone can use it. It is possible to register for a free account or for a Premium Account, but you do not have to if you just want to create a simple poll to find the best time to meet. So how does Doodle work? Depending on the type of event or meetings you are booking, Doodle works and looks a little different. But for the most part, when creating a basic poll, using the appointment scheduler for free you will be taken through the same steps each time. First, start by clicking ‘create a Doodle’ at the top of the page. On the first step include the name of the meeting, the location of the meeting, and any notes you like. For this example, we’ll use ‘Board meeting.’ The location is ‘our offices’ and we added a little note, which would be to look over the agenda beforehand. This is always a good tip! Second, you can then add the possible time options that you’d like to have for your meeting. You can choose from the week view or from the month view. If you’d like to use Doodle to conduct a survey or to send out an informal poll you can click text here. It’s best to include several time options to ensure that your guests can find a suitable time for the meeting. 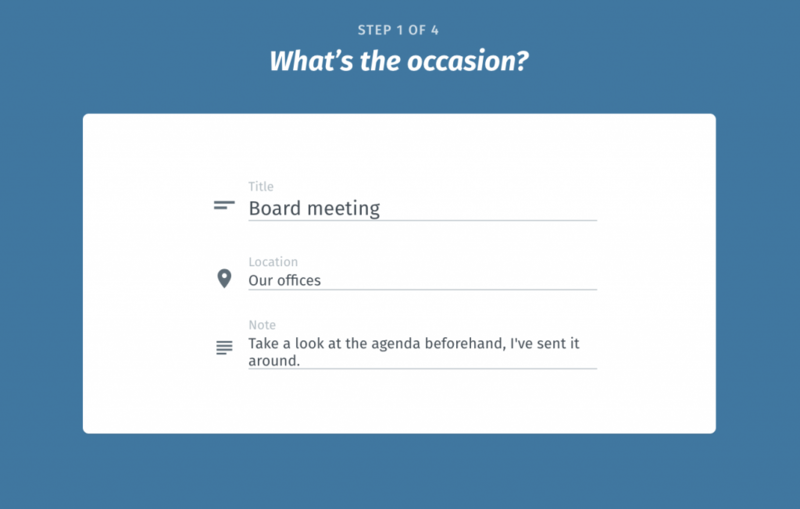 In this example, we’ll add several time options for the board meeting in month view. 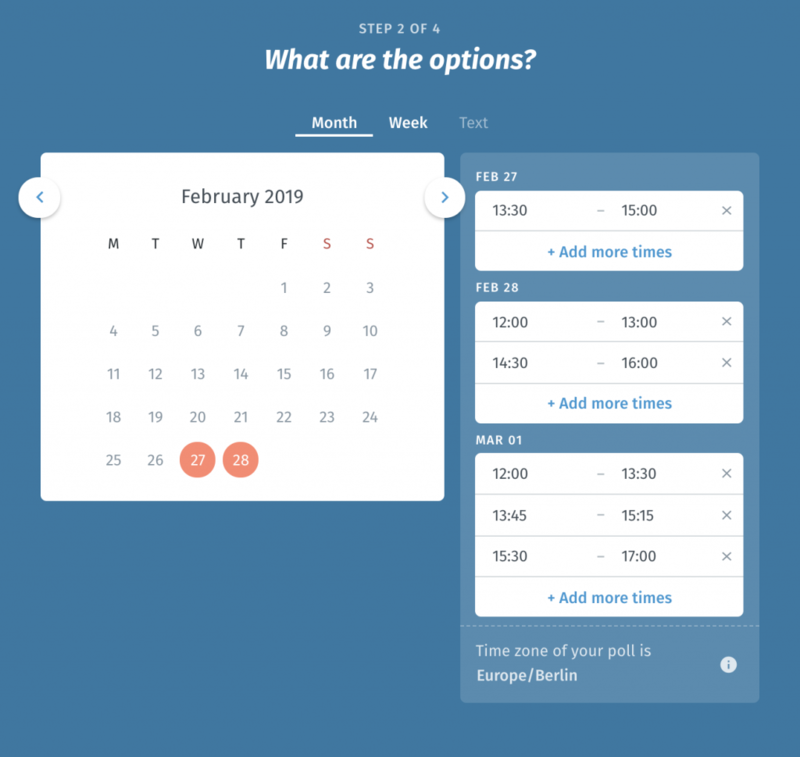 If you choose week view you’ll be able to see your connected calendar as well to make sure you don’t double-book or over-book yourself. Third, you can add all kinds of great bonus features to your meeting invitation. Some of which are free and some are available with a Premium Doodle account. Choose yes, no, if-need-be, limited options, or make the Doodle poll hidden for example. 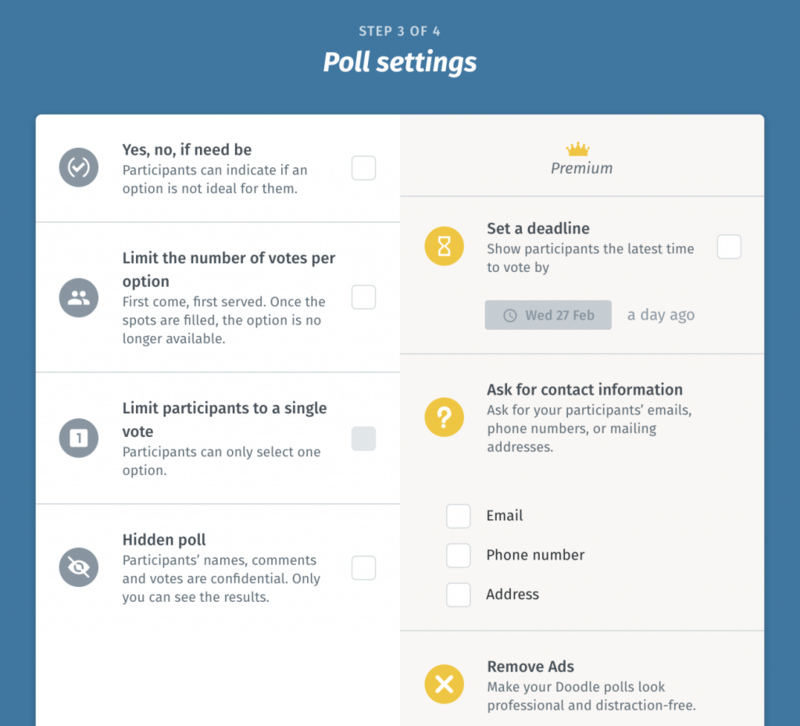 Premium users can also add poll deadlines and additional information requests. Last, add your email, and then send the Doodle you’ve created out to your participants. Simply add their email addresses to the box to send out the invites. They can vote on the dates they like and in minutes you’ve found the best time to for your meeting. Choose the final date and close the poll to let everyone know. Doodle is the best free online scheduling tool around!